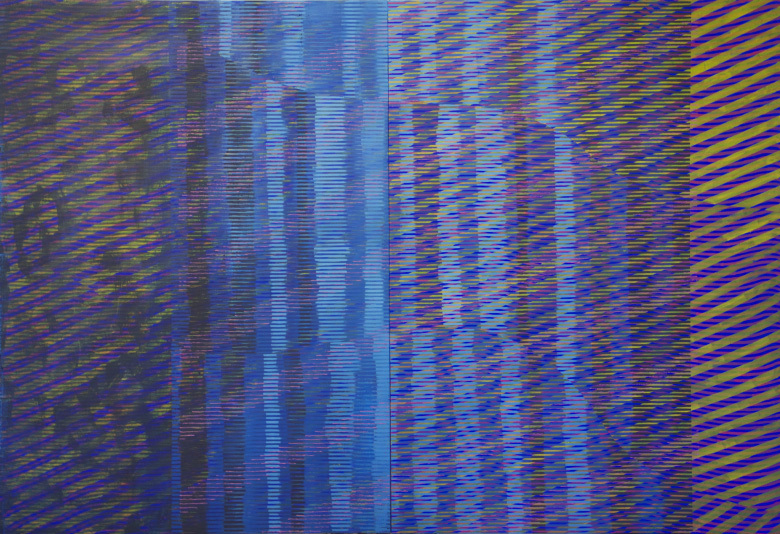 Joel Arthur’s practice focuses on making paintings that utilise the variation of line and pattern to generate an optical event. Opposed to the flat, precise delivery of the Op Art movement in the 60’s, his works are more ‘painterly’: physical and gestural delivering a range of spatial illusions ranging from planar to atmospheric. An integral ethic in his practice is flaunting the hand of the maker being present while simultaneously delivering a perceptually charged experience. Paint may slip, a brush dips, gesture wavers, a logical system of marking distorts, where abstract images are constructed through a range of material processes. Using a range of tools such as combs and squeegees to apply and remove paint, the abstract imagery draws on inspiration from the natural world and technological/digital realms. Joel Arthur currently lives and works in Canberra, ACT.